Anyone can help out with this project, but please follow the rules in this post to make sure everything will go relatively smoothly. Please read through all of this before you start mapping. First of all, you need the US version of the game. Then, to make sure we don't have any palette conflicts later on, you should use the same emulator and graphics plugin as everyone else. The emulator we've chosen is ePSXe, and we're using Pete's OpenGL graphics plugin. You need to use these settings. Alright, now that you've chosen a room you can get started. Take screenshots in ePSXe with F8. Then just put them together in your favorite image editor. Save all images as PNGs (I suppose BMP would be fine, too). Since we can't disable layers in ePSXe, you might have trouble getting rid of the status bar in the upper left. If you need it, you can use GLIntercept to get the tiles behind the sprites. Just put the DLL file and the settings file in the ePSXe folder. Then run the emulator, and lots of images will get dumped to the "images" folder. Since it makes hundreds of files very quickly, you should only use it briefly. Get to the place you need without GLIntercept, make a savestate, exit the emulator, put the DLL file in the folder, then run it and unfreeze for a second or two. Then just look through all the images for the tiles you need. We're going to have all the animated elements synchronized in the end, so it's best if you do this while mapping the first time. There are lots of different kinds of candles and torches, so I'll post the frames we're using for reference. If you come to a room with candles unlike the other rooms mapped so far, just choose a frame you like and stick with that. You shouldn't copy and paste these into your image, except the red door. These are tricky to deal with. You probably won't want to do many of these. I won't go into details right now, but you need to separate the background from the foreground and keep them in separate files. Please leave them in separate files in case we need to change them later. There are several areas that we're going to have to figure out strategies for later, like the chapel with the 3D background. If you come to one of these rooms, either skip it for now or post in this thread for assistance. If this meets with general approval, I'll have Jon move it to the Maps in Progress board. This game is inherently difficult to map since there is no layer disabling in ePSXe (or any other PSX emulator). I suggest that we all pitch in and map a room or two each, and slowly progress towards a full map of this game. It would take a long time, but we don't have any deadlines. We would all have to make sure to use the same emulator with the same settings to ensure uniform palettes, as that got to be a problem in the last project. Anybody have any ideas for or against? I'll post what I've done of the intro level, "Final Stage - Bloodlines", tonight. As for the alignment, it isn't as bad as Edsword said (certainly not as bad as "Harmony Of Dissonance"). It's just that any vertical transition between rooms *will* have a theoritically 48/practically 49 pixel gap in between. We'll just have to deal with it though, as practically all the 'Castletroids' have gaps between their various sections, just not always in the same way. I'll explain with a nifty little graph tonight too. Yes, I know there will be difficulties with the backgrounds, but as with any game with parallax backgrounds, we'll have to make do. I suggest that we all maintain three separate layers for every room we do. One with the background, one with the foreground, and one with any sprites that we decide to keep. That way we can always go back to the original, unmodified backgrounds if someone has a different idea. Terra, which plugin did you finally end up using? I'll edit my first post with all the guidelines and tools after more people have their say. Not sure if I would want to participate, but if there's no deadlines, I suppose the pressure is less. I would certainly not be "leading" this project in any way, or even close to it - someone who knows how to handle parallax backgrounds and 3D elements ought to be. I certainly approve, now I hope there's enough interest. Don't forget, this is HUGE - and two castles, even! I foresee this project lasting at least a year, probably longer. As long as this board is around, though, I think it will survive. If someone gets sick of the game they're mapping, they can take a stab at some of this. I'd be perfectly happy to organize everything. I can't guarantee I'll be mapping 24/7, but I'll try to do some every once in awhile. Funny thing is, earlier today I was thinking of making a topic about another project. Though I might still...it's about next April Fool's. It's still a ways away, but two months was barely enough for it this year...and we don't have any ideas for it yet! Obviously, that would be a separate project from this. I'm hoping that a full Symphony Of The Night map will put VGMaps.com on the map. I mean, seriously on the map of the "intarweb". It will certainly be a feat. Hope you guys are up to it and can finish it. I certainly won't be mapping this full time, but I would come back to it every once in a while. The purple is where a parallax background would go (in this case though, it was a 3D scene). The blue spot in Dracula's chamber is what's left of the status bar (I haven't yet searched through GLIntercept's captured tiles to fill the hole) while the blue on the left of the staircase is because that area isn't visible and there might be a wall there. I think I'm unlikely to find out until I play the game with Alucard and reach the (now broken) stairway, allowing me to fly under to take a look. Do consider that the 3D background was/is incredibly hard to remove, which is why there are tons of pixels left all over/under it right now. The vertical spacing between the rooms was derived from Edsword's Library Map. 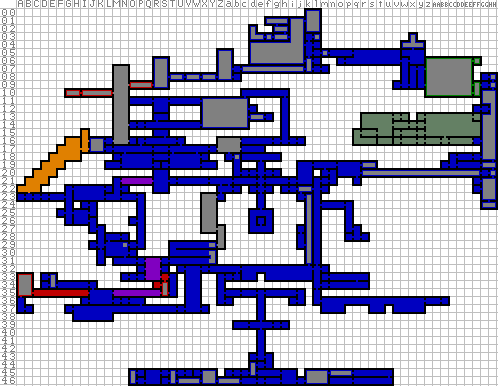 Each square on the minimap corresponds to a 256 x 256 pixels area. However, a room with no vertical scrolling is only as tall as the screen, which is 207 pixels (technically, it would be 208 since it's a multiple of 16 but the game covers the 208th line with a black area; it's not worth the bother to try and fill that missing line in my opinion). Since 256 (theoritical height) - 207 (actual height) = 49, the vertical spacing between separate rooms is always 49 pixels. For rooms with vertical scrolling, each 'square' is really 256 pixels high instead of 207 except for the bottom one since it lines up with the other 1 screen high rooms. Let me whip up something to show that using Edsword's Library map. Wow, good work. That'll certainly come in handy once we actually get started. I have a problem with GLIntercept, though. Every time I run it it dumps thousands of images and slows down the game greatly. Is there a way to decrease the frequency, or do you just run it briefly then sort through all the images? Also, did you find a button to take screenshots in ePSXe? The graphic plugin I use when taking screenshot is P.E.Op.S. Soft Driver 1.17 with No Stretching, since it renders the game without any 3D acceleration and pixel stretching. The key for screenshots is F8, although it captures the whole graphic buffer, which includes the actual screen twice and a whole lot of messed tiles and graphics which are distorted and with funky color palettes. As for GLIntercept, by default it logs *every* OpenGl call, which means everytime a tile is passed into the buffer it saves the whole buffer to disk. That's it saves so many images where only a little part changes from one to the next. Personally, I'd create a save state where the mapping is happening, run with GLIntercept for a few seconds to get all the tiles, then go back with the soft driver to capture the screen proper (since the status bar takes so much place on-screen, you need 2 captures for every screen of map you want to make). Do the backgrounds use palette based images or 16+ bit color? I have no idea really. I know next to nothing on PSX emulation. I just realized that all the tiles/textures in the buffer saved on file actually have all their borders doubled, meaning that in addition to sorting out the tiles by hand, you actually have to remove all 4 borders of them to obtain usable 16 x 16 pixel tiles. This is really going to be a tough game to map with such useless tools. I'll choose a random room somewhere and map it soon. That is, if I don't get too caught up actually playing the game. Look at my Open GL settings (altho this was from a while ago - not sure if it matches the current driver). Also "stairs fix" was one of our (me and wileee) attempts to deal with the vertical issue. Finally, there's a file with the map progress there - it's huge dimension-wise but not kb wise. Not to discourage you or toot my own horn but there's a TON of work in that complete library file that you might not be seeing. Not only the scrolling backgrounds, but I had to fill in a lot of space to make the large areas look better. All I'm saying is Good Luck (you're right tho that there's lots of rooms with no scrolling at all that will be very easy).